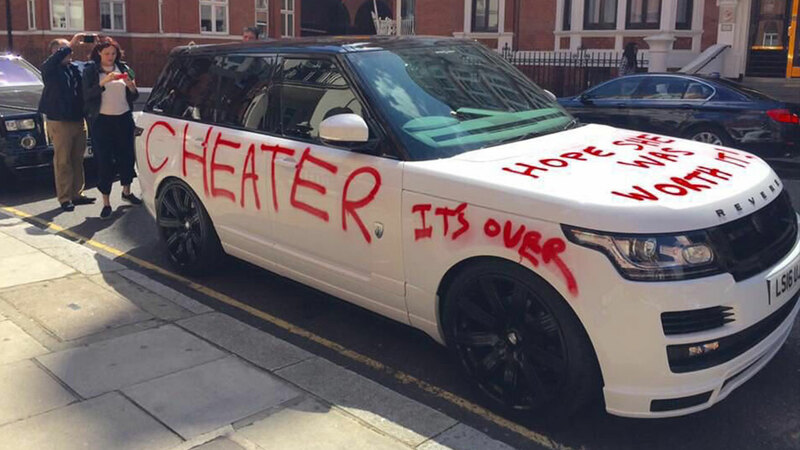 LONDON, England -- A customized Range Rover worth more than $100,000 was covered with graffiti by what appears to be a scorned lover. Twitter user @kloidaaa reportedly saw a woman spray-painting the SUV outside Harrods in west London, England. The white Range Rover was customized by "Revere London," and is - or was - estimated to be worth 75,000, or $108,000. "CHEATER," "HOPE SHE WAS WORTH IT" and "IT'S OVER" were written multiple times on the SUV. No word on who owns the vehicle or who wrote the angry messages, however unconfirmed reports say the vandalized vehicle may be part of a publicity stunt for a television show.